How do you build a Maven project without running unit tests? Currently restructuring some code I have for a Servlet and would like to try it out in my web browser (which means running mvn install to get the .war to upload to Tomcat). I'm fully aware my UNIT tests are failing and I'm fine with that because I will fix it once I have the code the way I want. Can anyone advise? 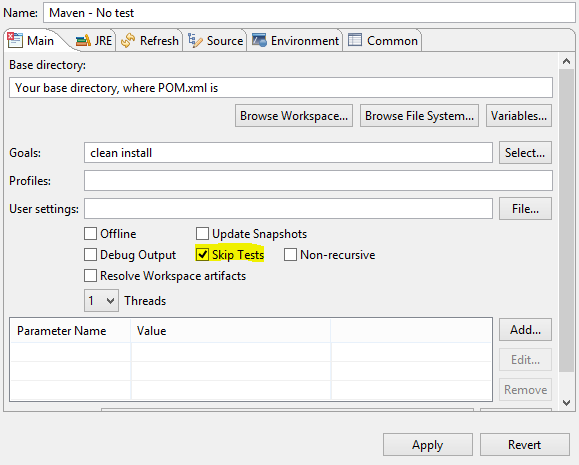 If you are using eclipse there is a "Skip Tests" checkbox on the configuration page. Now, the only difference from the answers above is that the "T" is in lower case. If you call your classes tests Maven seems to run them automatically, at least they did for me. Rename the classes and Maven will just go through to verification without running them. Not the answer you're looking for? Browse other questions tagged unit-testing maven-2 or ask your own question. Why can't code inside unit tests find bundle resources?